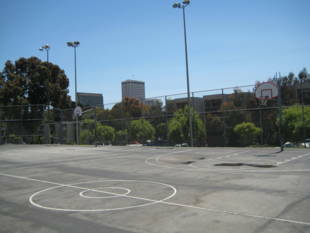 Margaret S. Hayward Playground is a great attraction for kids who live in the Western Addition. 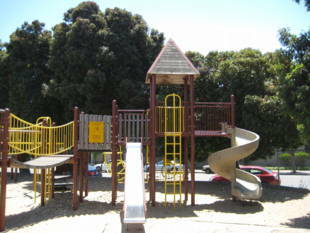 It has a play structure with sand pit, two tennis courts, two basketball courts, and two baseball fields. There are restrooms available. 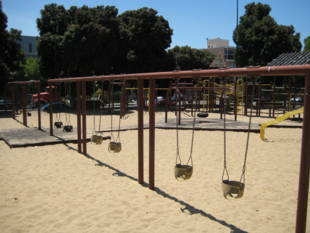 Margaret S. Hayward Playground is owned by the San Francisco Recreation and Park Department. Facility phone number is (415) 292-2018. #31 Balboa - Eddy and Gough or Eddy and Laguna stops. 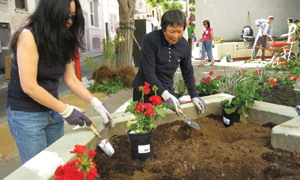 Walk one block south to Turk St. or two blocks south to Golden Gate Ave.
#5 Fulton - McAllister and Laguna or McAllister and Gough; walk one block north to Golden Gate Ave.
Register at SFRecOnline.org for classes and other programs. You can also search there for programs by location and activity too. Latchkey Program, Tiny Tots, and a variety of other programs are available at the rec center. Call (415) 292-2018 for more information. Laguna St. and Golden Gate Ave.